Following is a list of NSCA Sporting Clay Shoots we’re holding here at Highland for 2019. The shoots follow a similar format with scheduled shooting from 9 am – 3 pm. All are shooters are welcome. You do not have to be a registered shooter to participate. All SCTP shooters will receive a discounted rate! From all of us at Highland Hideaway Hunting to all of you, here’s hoping you have a wonderful holiday season. Merry Christmas and Happy New Year! If you’d like to enjoy a wonderful outdoor experience, come on out and see us. If you’d like to give the gift of the outdoors to someone on your Christmas list, we have gift certificates available. 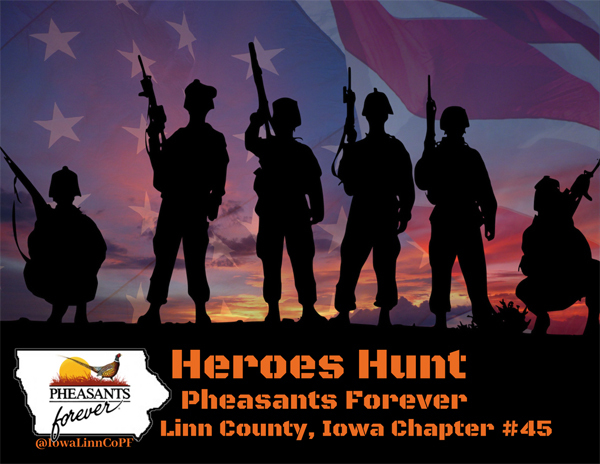 The VETERAN’S HEROES HUNT is hosted by Iowa’s Linn County Pheasants Forever Chapter #45. The 2018 Heroes Hunt is scheduled for Sunday, October 21. The 5th Annual Heroes Hunt will take place at the Highland Hideaway Hunting in Riverside, Iowa. Visit the Linn County PF website for more details.